Butter 4 small loose-bottomed tart tins. Divide pastry into four and line the tart tins, pressing it in gently and cutting off the remaining pastry. In a pan, heat the butter, add the sugar, vinegar and Cassis and stir until combined. Add the onions, bring to the boil, lower the heat to lowest and simmer for 30 minutes. In a jug, mix together the egg yolk and cream and add the goat’s cheese. Set aside. 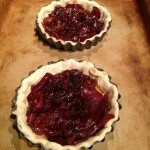 Divide the onion jam between the tart tins and bake for 10 minutes. 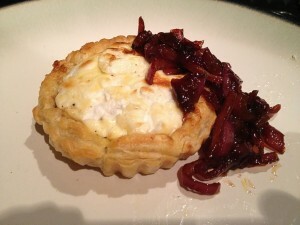 Take out of the oven and divide the goats cheese between the tins, spreading it on top of the onion jam. Bake for another 10 minutes until golden. Remove from the tins and carefully place on the plate. You could also serve with rocket, which makes a nice garnish.